MODEL CITIZENS: Ramkissoon and Williams sharing a moment; Williams accepting her award from National Bakery's Craig Hendrickson and Saffrey Brown. 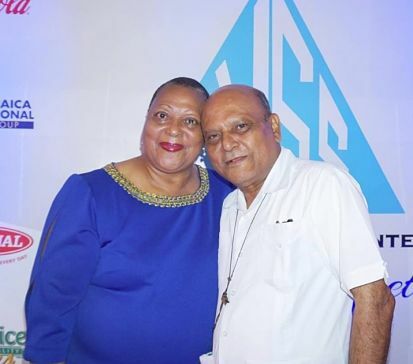 FOR his selfless, inspiring work with the Mustard Seed Communities, which he started with a still-unrepaid $600 loan from Joseph Matalon in 1978, Father Gregory Ramkissoon got his due on Thursday night, when he was inducted into the Council of Voluntary Social Services (CVSS) Hall of Fame, during the well-attended National Volunteer Awards Banquet at the Jamaica Pegasus Hotel. Now serving over 600 kids and young adults (including pregnant teens, disabled and HIV-infected persons), Mustard Seed has grown into an international ministry with some 20 outreach programmes. Sagicor, known for its vibrant community spirit and corporate social responsibility, was another of the night’s honorees, receiving the award for Private Sector Volunteer of the Year. 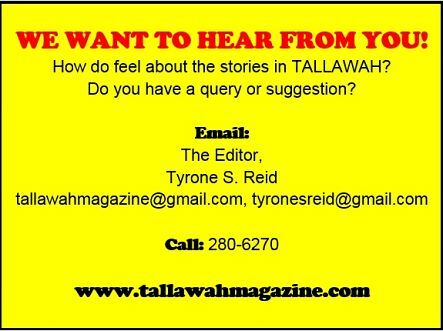 A group known as Young Women/Young Men of Purpose was presented with the Non-Profit Volunteer Organization of the Year award. 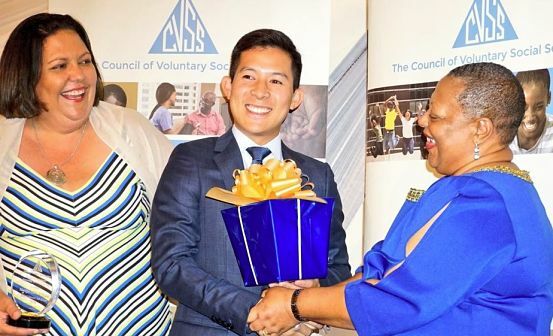 The Jamaica Cancer Society (represented by Earl Jarrett and Yulit Gordon) was named CVSS Member Agency of the Year. Individual awards were also handed out. Sergeant Nickoyon Brown, who runs a schoolboy mentorship programme, exposing kids to “experiences outside of their inner-city communities,” picked up the award for Public Sector Volunteer of the Year. Ardenne High alum Keenan Joseph Falconer, who started D’Yutes, with activities including a regular inner-city quiz competition, was announced as Young Leader Volunteer of the Year. “You give a little, you get a lot,” is the motto of Marilyn Lilith Williams, a former UK native now living in St. Mary (with over 50 years of volunteer service to her credit), who took home the award for Outstanding Volunteer of the Year.